These two are amazing, they truly are. As someone who believes in many different types of ways to heal someone, they have really opened my eyes to what spiritual healing can do for a person. My father has been battling cancer for almost 14 long years and there were many times we heard from doctors there was nothing more they could do for him… I honestly believe that the healing power that has come from Sunhee and Chineee has made such a difference in his power to overcome this disease over and over again…They have also shown me that although death is something many people are scared of and fear, (for themselves and their loved ones!) it does not mean the end of your relationship with the person who passes. That is a comfort to me, knowing that death is something I will always have to deal with in my life. Knowing that spirits are watching over me and can be my “guides/angels” is a peaceful feeling. Kismet: My soulful connection to Chinhee and Sunhee Park. They are incredible in every facet. 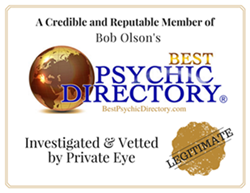 They are gifted psychics and empathic healers. After each separate reading with the twins, I felt peaceful and calm. Both women have brought an equivalent amount of insight, love and laughter into my life; but in their own autonomous fashion. They actually had me at hello. My first reading was with Chinhee; via telephone. The moment after I said, “Hello,” she told me that I have dark brown/black hair and blonde hair, too. Correct. I have dark brown hair with blonde low-lights at the tips. Mind you, this was a telephone reading. Her knowledge of my life still astonishes me. Soon after we spoke, her insights began manifesting (and still are). There are two specific points I would like to shine light on: travel and empathy. Firstly, I was planning to go on a trip in October. She said that wasn’t going to happen (even though, the trip was a couple weeks away from the date we spoke). I was shocked, since the departure date was imminent; but she strongly felt an interruption in plans. A few days later, my travel agent phoned me with last-minute, unfortunate news of a delay; due to overbooked flights. My jaw was frozen in a dropped position; for at least a day. Secondly, she told me I was very empathetic; and spoke of a male presence projecting his ailments/emotions on me. My father is the only strong male presence in my life; and she believed it to be him. At the time of our reading, I was dealing with upper respiratory issues, for the very first time. Soon after, at a family dinner, my father inquired about my breathing issues. Apparently, his allergies had been irritating him coinciding mine; and it was his first time experiencing a bad flare up. Once again, frozen jaw drop… Amazing. Sunhee picked up, and elongated, the frozen jaw drop right where Chinhee left off. She had me at “hello,” too. Sunhee immediately delved into my past and spiritual side. She revealed issues I’ve never shared with anyone. It amazed me whom she noted as my two main guides: my paternal grandfather and paternal uncle. I was surprised because I wasn’t close with either of them when they were alive. I must admit it was very comforting to know. She specified on their ways of communication and guided me on how to communicate with them. Their spiritual accompaniment is a way of making up for the lack of human connection with me. She knew my sensitive areas: neck, back and knees. Since I’m attune to my guides now, I have noticed my knees are sensitive to my guides’ presence. Any inquiry I send them, my knees get the chills. The stronger the chilling sensation, the more apparent the answer is to me… She assisted in linking my past, to my present and future; bringing things full circle.